For the first time, a massive solar flare revealed the process that created it, confirming new theories about flares and the explosive ejections of solar material often linked with them, a new study reports. Understanding how solar flares form brings scientists a step closer to predicting them, along with the dangerous space weather that has the power to damage satellites and power grids on Earth, researchers said. "The 2D standard solar flare model captures much of the physics involved, but has the inherent limitation of being a 2D model," said study lead author Jaroslav Dudik of the University of Cambridge. "There can be no slipping reconnection in a 2D model, since it is missing the third dimension, in which the slipping motion occurs." Solar flares — very intense brightenings of the sun's atmosphere — occur throughout the sun's 11-year activity cycle, with their frequency increasing as the cycle peaks, as it did around the 2012 event. Flares are classified by the peak X-ray flux measured at Earth. Smaller C- and M-class flares are far more numerous, with dozens of C-class flares sometimes occurring daily during solar maximum, Dudik said. In a study published less than a week before the event, a team led by Miho Janvier of the United Kingdom's University of Dundee provided a 3D simulation that showed how distortions in the sun's magnetic field can lead to solar flares. "We have extended in 3D the standard model of solar flares that has been, and still is, used to explain solar eruptive flares," Janvier told Space.com by email regarding his earlier research. "All in all, we are just completing pieces of the puzzle." Janvier also served as an author on Dudik's research examining the explosive flare. This was the first time the slipping motion had been seen in a solar flare. Scientists can't observe the sun's magnetic field lines directly, because they are theoretical lines of force. "However, it is possible to trace them with the material trapped in the magnetic field, similar to iron fillings you can put near a magnet," Janvier said. "One can observe the evolution of the solar corona's magnetic field by looking at the motion of the plasma trapped in the magnetic field." Magnetic field lines on the sun start off smooth, stretching between two points on the visible surface known as field line footprints. As powerful convection currents rise and fall beneath them, the footprints move about, causing the field lines to twist and entangle in regions known as flux ropes. Energy begins to build in the flux ropes until the lines snap and the energy is released, creating a solar flare and sometimes launching super-hot plasma into space. With their energy gone, the magnetic field lines return to straight, low-energy states. Slipping motion was first reported in coronal loops, not during flares. "You need the right event," Janvier said. Such an event allows researchers to see not only the field lines but also the intensely heated regions of plasma that follow them, enabling scientists to confirm that what they observe is slipping field lines. He further explained that spotting such flares requires good observations, where the brightness of the event doesn't overwhelm the event being observed. "During a flare, the emission is so intense that it is difficult to see the refined structures of loops," Janvier said. Finally, the events can occur too rapidly for either scientists or their equipment to notice them. "The slipping motion can be very fast," Dudik said. "In my opinion, it is therefore easy to miss." The Atmospheric Imaging Assembly (AIA) instrument on board the SDO spacecraft is the only one capable of capturing a video with the full detail required to spot the July 2012 event. AIA captures an image every 12 seconds, whereas previous instruments, only captured an image every minute. The more-frequent images allow for a closer inspection of the fast-moving events on the surface of the sun, including the slipping motion of magnetic reconnection. In a smaller, less-energetic flare, the reconnecting action could be a greater challenge to spot, even for today's technology. Speaking of how the the flare confirmed his research predicting the slipping motion, Janvier said, "That made the discovery very exciting, because suddenly what was still theoretical was really happening during flares." The new paper was published in the Astrophysical Journal. 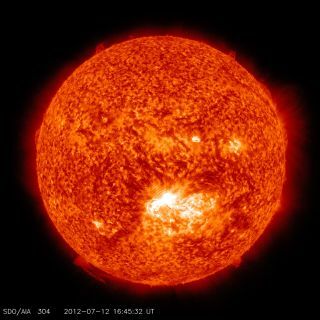 Solar flares are often linked to powerful explosions of material from the sun known as coronal mass ejections (CMEs). When CMEs are directed toward Earth, they can damage satellites, affect airlines and knock out electricity grids. Although the CME associated with the 2012 event faced Earth, Jaroslav said it "was a weak one, and therefore posed no threat." Other CMEs have had more devastating effects. In 1989, a powerful solar flare and the resulting CME damaged a transformer in Canada, leaving over 6 million people without electricity for more than 12 hours. That storm was only a fraction of the power of the "Carrington event" of 1859. The massive historic flare disrupted global telegraph communications, shocking some telegraph operators and even allowing some machines to run when disconnected from their power supplies. Although solar flares and CMEs are related, they do not always occur together. "The CME is a byproduct of the flare, similar to an ash cloud from a volcano, but it is not always present," Janvier said. Magnetic slipping has only been seen in the most powerful, X-class flares, though it could happen in other, weaker types as well. The scientists intend to continue studying other types of flares for the slipping mechanism. "It is unknown whether the phenomenon occurs in all flares. It is certainly predicted to be" present in all flares, Dudik said. "But we need to analyze other observations."